Beyond Plutocracy - True Democracy for America: Download a Free Copy of Beyond Plutocracy to Your Computer. The book Beyond Plutocracy - True Democracy for America, hereafter simply Beyond, is a formally copyrighted work registered with the Library of Congress Copyright Office. I, Roger D. Rothenberger, am the author, creator, and sole owner of all of Beyond’s text, graphic images, and figures, of the Beyond Plutocracy web site http://www.beyondplutocracy.com, and of all web pages, articles, and other materials at the site. I have made the entire content of Beyond available for you to read free at this site in HTML format. Beyond is also available at other web sites in eBook formats for you to download for free. (See the eBook section below.) But Beyond is not in the public domain. I set the following limitations on and grant you the following rights to your use of Beyond and the other materials at this site. All other rights are reserved. You may read online the entire book and all other materials at the web site. You may not download a copy of Beyond or the web site to your computer or other device. 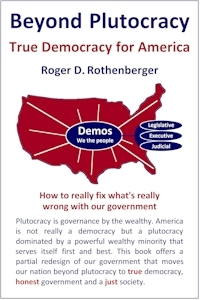 If you want to share the book with others, you may and in fact please do share with them a link to the site http://www.beyondplutocracy.com. Beyond and the other materials at the site are available for your personal reading only. I do not grant you the right to any form of commercial use. You may not give copies of Beyond away or sell copies at cost or for profit. You may not convert the text, images, or HTML-formatted web pages constituting the Beyond book or any of the other web pages or content at the site into any other format. You may use properly cited quotations from Beyond. Proper citation includes title, subtitle, author’s name and web site address http://www.beyondplutocracy.com. If your media supports it, please include an active hyperlink to the Beyond site. There is one web page at the Beyond site that you may copy in whole and share with others in any way you want, e.g., as email or web page content or as a web page file attached to an email. The page contains a brief (2200 word) summary or synopsis of Beyond. You may add your own signed message to the top of the page, but you may not alter in any way my content on the web page. The page's Internet address is: http://www.beyondplutocracy.com/bp-brief.htm. 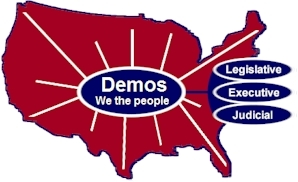 You may and in fact please do link your web sites and social networking pages to Beyond Plutocracy - True Democracy for America at http://www.beyondplutocracy.com. Thank you. Feel free to download a copy of and use the following image for such purposes. Simply highlight and save the image to your device. Beyond is available in several eBook formats at the Smashwords web site. You must join (free) to purchase books there. You get your own web page Library space to manage books you purchase. Once you buy a book, its several eBook formats become available to you for downloading immediately and at anytime in the future. The link to Beyond at Smashwords is www.smashwords.com/books/view/259279. Some eBook formats available at Smashwords and my comments about them. Kindle devices & apps Excellent, both in color in my desktop computer Kindle app and in black and white in my B&W Kindle device. Apple iPad/iBooks, Nook, Sony Reader, Kobo, and most e-reading apps including Stanza, Aldiko, Adobe Digital Editions, others Excellent text. A minor detail: I get a poor quality eBook cover image in my Adobe Digital Editions app on my desktop computer. Use only for older model Sony Readers that don't support .epub I've not seen this and can't comment. For Palm reading devices I've not seen this and can't comment. Smashwords says: readable on most word processors Readable but unacceptable. What I get has large blocks of uppercase text. Smashwords says: flexible, but lacks much formatting Lacks much formatting, indeed. What I get is one huge, useless block of text. On its Smashwords Support Center and FAQ ( Frequently Asked Questions) page, the Smashwords web site has an excellent explanation about where to download the most commonly used eBook reader application programs and how to load a purchased eBook into your particular reading application program or device: http://www.smashwords.com/about/supportfaq. The page contains links to the sites where eBook reader application programs may be downloaded. Your application or device will also have a manual or help system that tells you how to load and display an eBook.